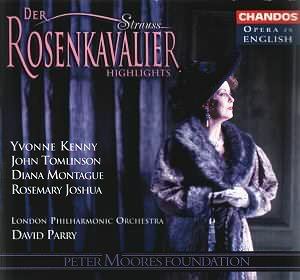 London Philharmonic Orchestra conducted by David Parry. It's all a matter of taste whether you prefer your opera in English or the original language and whether you prefer "bleeding chunks" highlights or the unfolding of the complete production. There is no denying that Chandos present here a generous helping of highlights with only 20 seconds short of what we are given to understand is the maximum capacity of one CD (i.e. 80 minutes of music). Clearly in a production that normally takes some 3 CDs to accomodate there has to be some grievous ommissions and for me they include the marvellous Act I tenor aria (quite irrelevant to the plot but who cares?) that was sung so beguilingly by Nicolai Gedda in the Schwarzkopf/Karajan recording and the sparkling orchestral prelude to Act III. Chandos's ravishing sound is ideal for the hot house opening scene of the opera as we hear the birds' dawn chorus after Octavian and the Marschallin have enjoyed a night of passion, Strauss's opulent scoring tells us all. In this opening scene where Octavian protests his love, the advantage of the immediate comprehension of English helps one to appreciate Strauss's subtleties and ironies. When for instance, Octavian murmers "...for I alone know your secrets", the woodwinds tell us that he is deluding himself. This opening excerpt closes after Marschallin has confirmed softly and tenderly (almost, and appositely, motherly) to Octavian that "You are my boy, you are my heart..." and after that meltingly beautiful brief orchestral description of their bliss. Then we go straight to the closing of the first act when Baron Ochs has been seen off. Marschallin rues his boorishness but then turns to her own predicament and begins to reflect on the pasing of time. During a bittersweet exchange with Octavian when she predict that he will soon forsake her for a prettier, younger love, she tells us in one of Strauss's most touching and evocative arias that " ...time is a mysterious thing" and that ..."Sometimes I arise in the dead of night, go to my clocks and stop them every one..." Kenny rings one's heartstrings here. The Act II Presentation of the Rose is given in its entirety. The procession and the duet between Octavian and Sophie as they begin to fall in love are magical. The Act II conclusion excerpt is concerned with the setting of the trap for Ochs. John Tomlinson is in excellent form as the boorish old womaniser ardently singing: "with me not a night is too long" to one of Strauss's most beautiful and most memorable waltzes. The final excerpt begins as Ochs gets his come-uppance and is chased from the inn by all his creditors and "children". But the big attraction is that famous, wonderful, soaring trio as the Marschallin lets Octavian go and blesses the young lovers while Octavian and Sophie at first awkward, guilty and confused, surrender to their love. Who could be unmoved by such an exquisite celebration of the feminine voice? Following on we have the equally beautiful unearthly duet between Sophie and Octavian as they swear eternal love to each other. The excerpt ends as the opera ends as the little Black Boy returns to the now empty stage to retrieve the Marschallin's handkerchief thus giving the audience time to compose themselves before the lights go up - just one instance of Hofmannsthal's and Strauss's sublime sense of theatre. This is a sparkling production wth all the principals in very good voice. I would suggest that it is a very good introduction for newcomers to the opera and a valuable aid in further appreciation of the opera. Listen to this first then set aside an evening to hear the whole opera - either the 1954 Erich Kleiber Decca recording with Maria Reining, Sena Jurinac, Hilde Geuden and Ludwig Weber or the 1957 Karajan set with Schwarzkopf, Otto Edeelmann, Christa Ludwig and Teresa Stich-Randall, and Ljuba Welitsch as Marianne.